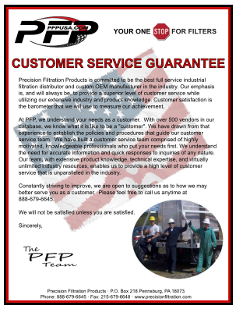 Precision Filtration Products is both an industry leading distributor, and a vertically-integrated manufacturer of industrial and commercial filtration products. We feed our families by supporting and supplying products to USA-based manufacturers, so we proudly concentrate our efforts on supplying filters and filtration products manufactured in the USA. Our product offering is extensive, and may be unrivaled in the industry. Representing the industry leading manufactures, we provide all types of air, gas, and liquid filtration products. Including filter bags, filter cartridges, filter elements, and complete filtration systems. On the manufacturing side, custom OEM filters are our specialty. 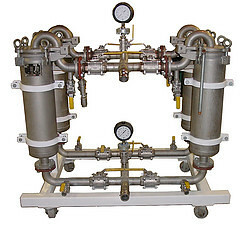 We design and build filter bags, filter discs, filter elements, and custom portable filtration systems and filter carts. From concept to completion, long or short run we have the solutions, the technology, and the ability to meet your requirements. Contact us with your next filter requirement or custom project and put us to work for you! My question is for the WS09-Series-Water-Sensor. I am working much with transformers and transformer oil. Do you have any more information on this item and what does it cost? Good day Mr. Namani. 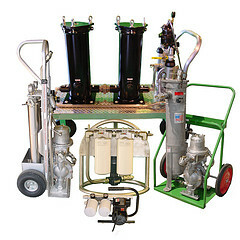 We are experts in oil filtration equipment. 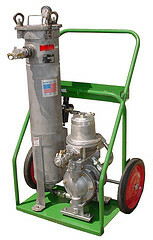 Feel free to reach out to us directly using the contact form on our primary website anytime, making sure to include details such as the brand/type of oil, its viscosity, the volumes involved, flow rate, pressures, temperatures, as well as the contaminants that you want to remove, and most importantly with regard to particulate, the retention level that you want to achieve, ideally according to the ISO 4406 cleanliness code. Thanks in advance, and we look forward to hearing from you.